Different countries and organizations define genetic modification (GM) slightly differently. In general, GM refers to making changes to a living thing’s genetic information that would otherwise not occur by natural mating or reproduction. This would usually involve using methods of biotechnology, such as “recombinant DNA,” “gene targeting”, or “genome editing” to add, delete or otherwise change an organism’s DNA. Genetic modification can also involve moving genetic material between species. Genetically modified organisms (GMOs), including microbes, cells, plants and animals, have long been used in scientific and medical research as a way to understand processes in biology as well as the mechanisms of diseases. The use of genetic technologies to treat diseases or make other modifications in humans, called “gene therapy,” has been attempted since the 1990s. Less than a handful of these treatments have so far been approved by safety and regulatory agencies such as the US Food and Drug Administration. Using gene therapy to directly treat the genetic causes of diseases has long been an aspiration for physicians, scientists and patients. Some diseases, such as cystic fibrosis or sickle cell anemia, are relatively well understood to be caused by variants in single genes. In these cases, there is hope that, if the disease-causing gene can be corrected or replaced, then it may be possible to cure individuals with the disease or at least prevent the disease from worsening. However, gene therapy is more difficult for more complex conditions such as heart disease, diabetes or many forms of cancer, which result from the interplay among many genes and between the genes and the environment. In order to use genetic therapy to treat diseases in an individual after birth, a significant portion of cells in the relevant tissues or organs may need to be modified. This presents technical challenges to safely and effectively deliver the modification machinery and/or alternate versions of genes to the target cells, and to successfully make the changes to the cells’ genome with minimal mistakes. If the modification is made to the “germline” (including reproductive cells as well as the cells in early stage embryos), then all cells in the body of subsequent generations will inherit that modification, as well as any mistake or unexpected change made during the process. There are two components to the CRISPR system: a molecule known as a “guide RNA” (gRNA), which has the same sequence as the target site in the genome; and a “nuclease” (i.e., a DNA-cutting molecule) called Cas9. When both of these components are delivered into a cell, the gRNA will bind to the target genomic site through complementary base pairing (meaning, A’s will bind to T’s and G’s will bind to C’s). In the process, the gRNA helps bring in Cas9 to the target site to make a cut to the DNA double helix. The cell’s natural DNA repair mechanism will close this gap, but because the process is not perfect, a few DNA bases will be added or deleted. This renders the original gene – e.g., a gene variant linked to cancer, or one related to HIV infection – nonfunctional. Alternatively, a different version of the target gene can be placed into the cell along with the gRNA and Cas9. The cell will then use this alternate sequence as a “template” to repair the broken DNA, copying and incorporating it into the genome. Doing so could allow an undesired version of the gene to be replaced with a desired copy. Recent scientific breakthroughs have brought within reach the possibility of “editing” the genome to repair disease-causing genetic variants. While it is still early days, the hope is that gene editing technologies may one day provide a cure for genetic diseases such as sickle cell anemia, cystic fibrosis or Huntington’s disease, and enable people to better fight off viral infections (e.g., HIV). Researchers have used CRISPR in cells from human, plants and animals; in fact, CRISPR has worked in all species examined to date. Notably, the CRISPR technology has been used to reverse symptoms in an adult mouse with a liver disorder and to alter DNA in non-human primates — important steps towards developing new gene therapies in humans. While genetic changes introduced into a liver cell will not be inherited in the genome of any of the individual’s future offspring, DNA alterations that are introduced in the cells that will become egg or sperm, or the cells in early stage embryos, can be passed on to future generations. This is known as germline editing, and its prospects have led to discussion and debate worldwide about whether germline genetic modification in humans is appropriate, and whether or how society should proceed with such research and possible application. On one hand, critics emphasize both the technical and ethical issues with making changes to the genome that can be passed down to offspring. There are concerns that any unforeseen effect in the editing process can become inherited. Other questions are being asked — do we have the right to alter the genome of our future generations? Would the editing of certain diseases or disabilities lead to stigmatization of people who are living with those conditions? And who gets to decide what are considered diseases or disabilities that should be edited? At the same time, proponents argue that germline modification can potentially eliminate diseases such as Huntington’s disease, a debilitating neurological condition caused by a single gene variant. They also argue that humans have long been altering the lives and genetics of our offspring without their explicit consent, through procedures such as genetic counseling and preimplantation genetic diagnosis. 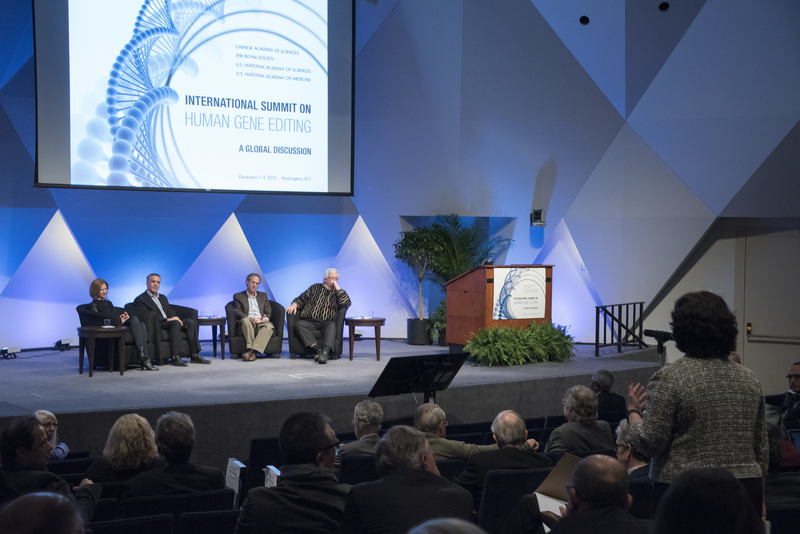 In December 2015, the US National Academies, the UK Royal Academy, and the Chinese Academy of Sciences convened scientists, social scientists, ethicists, and other stakeholders for an International Summit on Human Gene Editing in Washington, DC. A statement released at the end of the summit emphasized that it would be “irresponsible” at this time to proceed with the clinical use of germline editing, but did not recommend banning the technique, instead suggesting that research should continue. In February 2017, the US National Academies’ expert committee on human genome editing released its report, recommending that research on, and use of, somatic genome editing for medical treatment should continue under the existing regulatory framework, but that there should be “broad public input” before expanding the technology’s application to “genetic enhancement.” At the same time, the report recommends that clinical trials for germline genome editing to treat “serious diseases or disabilities” should proceed only after much more research, and only when stringent technical and ethical criteria are satisfied. Going forward, the report emphasizes the need for continued public engagement and policy debate. Currently, germline genetic modification is illegal in many European countries and in Canada, and federal funding in the United States cannot be used for such work. As of January 2017, researchers in the UK, Sweden and China have received approval to perform gene editing in human embryos for research purposes only (in addition, existing laws or guidelines in these countries only allow research on embryos up to 14 days after fertilization). In November 2018, news reports emerged that the first children whose genomes were edited with CRISPR during their embryonic stage, a pair of twins, have been born in China. While the claims have still not been independently validated or published in peer-reviewed journals, the claims have drawn significant controversy. In 2019, scientists, ethicists and the broader society continue to debate the path forward. CRISPR has also opened a pathway to engineer the world around us for the benefit of human health and our environment. Applications include the possibility of modifying or even eradicating disease-spreading insects, such as mosquitoes. It might also be possible to re-create long-extinct animals, such as the woolly mammoth, to roam the Earth once again, which, some scientists think, may help address climate change. However, not everyone agrees these applications would necessarily be a “benefit,” while others worry about unintended consequences of these ecosystem-changing actions. Gene editing has significant potential to benefit human health. At the same time, it raises profound questions that require public deliberation — what if we make alterations we regret? What if seemingly safe genetic changes prove to have unintended consequences? What are the standards for safety as the medical community seeks to explore these tools in an effort to diminish suffering? Additionally, if as a society we agree that the use of genome editing is acceptable, how do we ensure that all individuals are aware of the potentials of these technologies, and that everyone who wants to access such technologies can afford them? Researchers, bioethicists and policymakers, including a number of the scientists who pioneered CRISPR, have called for caution and the need for public consultation and dialogue that also involves faith leaders, environmental activists, and advocates for patients and for people with disabilities. As society seeks a balance between the desire to realize the benefits of gene editing and a variety of other concerns, pgEd hopes to play a part in facilitating broad conversations that engage all communities and ensure that diverse values and voices are heard. For more about the technical and policy issues around CRISPR and genome editing, click here. Summary: Recently developed techniques to easily modify DNA, known as “genome editing,” are bringing many new possibilities as well as dilemmas to the forefront of medicine, ethics, religion and society at large. One technique in particular, known as “CRISPR,” has generated the most excitement due to its efficiency and ease of use. This lesson introduces students to the basic scientific concepts of genome editing, its potential for improving human health, as well as some of the ethical discussions surrounding the development and applications of the technique.